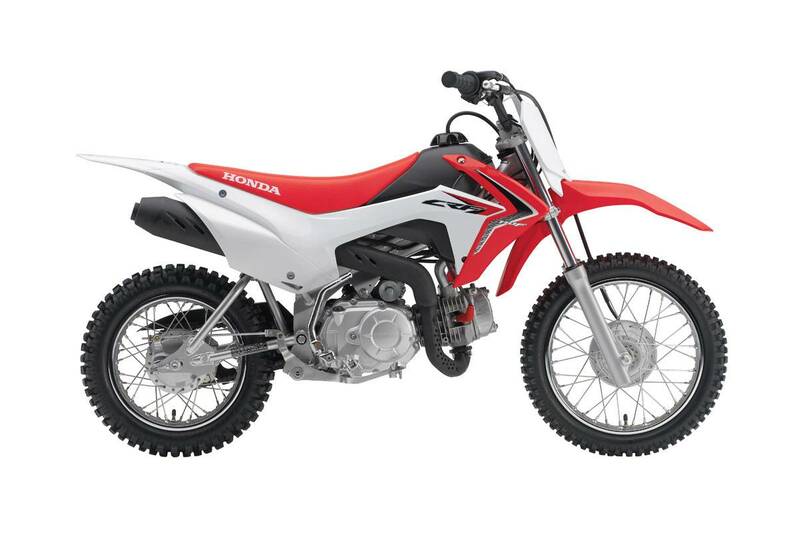 Honda's CRF110F has a 109cc air cooled, two valve, SOHC engine which offers consistent performance everywhere in the rev range. The automatic twin clutch system features two types of independent clutch; one for starting, the other for shifting. This four-speed manual gearbox with automatic clutch makes changing gears easier and smoother than a conventional system. A 1.2 litre airbox provides ample airflow into the engine and a digital ignition gives the engine optimum ignition timing. The steel backbone frame and swingarm blend a high balance of rigidity with a certain amount of tuned flex, allowing the rider to fully exploit the engine's capabilities. The frame also incorporates safety covers at heat points, and carrying handles for easy transport. The suspension offers optimal traction and stability. The telescopic front fork diameter is 31mm and has 100mm of travel, while the rear shock absorber features a 28mm piston damper, up 7mm, with 100mm travel. Drum brakes front and rear provide ample, and measured braking force. The front wheel size is 14in with a 2.5 x 14 tyre; the rear 12in with 3 x 12 tyre. The body kits 'triangle proportion' gives a crisp and modern appearance. The body kits 'triangle proportion' gives a crisp and modern appearance. Fuel capacity is 4.9 litres, and wet weight of the CRF110F is 74kg.